Touch the New Event icon. The icon might appear only when the phone is oriented horizontally. If you don’t see that icon, or any Add icon, touch the Action Overflow or Menu icon to locate the New Event command. The New Event screen appears. Your job now is to fill in the blanks to create the event. Set information for the event. The more information you supply, the more detailed the event, and the more you can do with it on your phone as well as on Google Calendar on the Internet. Touch the Done or Save button to create the event. The Done button has a check mark by it, and it’s located in the upper-right corner of the New Event screen. The new event appears on the calendar, reminding you that you need to do something on such-and-such a day. When an event’s day and time arrives, an event reminder notification appears, similar to what’s shown. You might also receive a Gmail notification, depending on how you chose to be reminded when the event was created. You can change an event at any time: Simply touch the event to bring up more information and then touch the Edit icon to make modifications. Calendar categories are handy because they let you organize and color-code your events. They can be confusing because Google calls them “calendars.” Think of them more as categories: different calendars (categories) for personal and work schedules, government duties, clubs, and so on. Try to avoid using the Phone or Device category for your events. 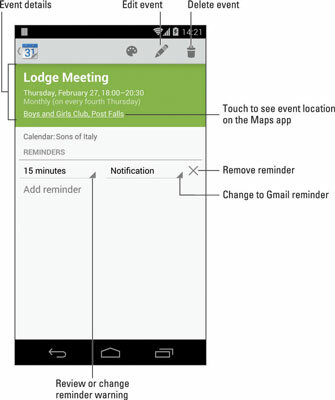 Those events appear on your phone but aren’t shared with your Google account. Type location information for an event as though you’re typing a search query for the Maps app. When the event is displayed, the location becomes a link; touch the link to see where you need to go on the map. When the event lasts all day, such as a birthday or your mother-in-law’s visit that was supposed to last for an hour, touch the All Day box to add a check mark. When you have events that repeat twice a month — say, on the first and third Mondays — you need to create two separate events, one for the first Monday and another for the third. Then have each event repeat monthly. You can set additional reminders by touching the Add Reminder icon. To remove an event, touch the event to bring up more information and then touch the Delete icon. Touch the OK button to confirm. When deleting repeating events, you’ll need to specify whether all events are being removed or only the one. It’s necessary to set an event’s time zone only when it takes place in another time zone or when an event spans time zones, such as an airline flight. In that case, the Calendar app automatically adjusts the starting and stopping times for events, depending on where you are.